A good squat rack is an important part of any home or commercial gym. In fact, most people would say it’s a must-have, and we would agree on that notion. Yet, a squat rack with a pull up bar built into it adds another helpful dimension that saves you space while giving you more options for exercise. That’s why we’re going to take a look at some of the options for the best squat rack with pull up bars. We'll cover some options that range in price between $80 and $300, as well as share with you some top tips on how to choose the right model for you. Since we’re going to be looking at squat racks, you’re definitely going to want to know what benefits you get for using such a setup. Here is a quick look at some of the most important reasons that you should get comfortable with the bar on your shoulders. You Build Functional Strength- Squats use a lot of different muscle groups that help you get strength in many places on the body at once. 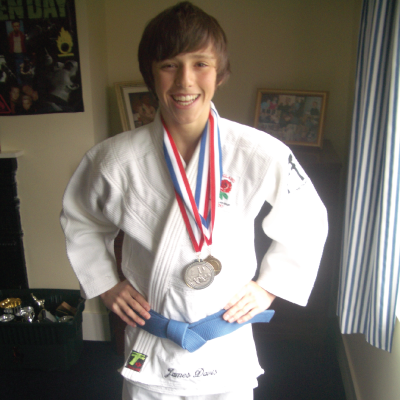 It can help you focus on overall power rather than just be good at lifting weights in a gym. You Train Multiple Important Muscles: Squatting helps make your glutes, hamstrings, and quads all at the same time. These muscles are used in a lot of actions like running, jumping, and kicking, so no matter what you are training for, there is a use for squats. Building Muscle Helps You Burn More Fat: This one is kind of self-explanatory. You build muscle and burn fat all at once. Increases Your Knee Strength: Knee injuries are devastating for every kind of athlete, but squats can make your knees less prone to injuries. As you can see, there are a lot of reasons that you will want to do some squats. You can get stronger, reduce injury potential, and develop many parts of your body at a single time. Since we are looking at the best squat rack with pull up bar, it’s important to understand what you get out of having that extra piece on the rack. First things first, though - you have to know the difference between a chin up and a pull up, in case you thought they were the same thing. A pull up is when you use an overhand grip on the bar and lift yourself with your hands a little wider than shoulder width apart. A chin up is when you use an underhand grip and spread your hands about the same width as your shoulders. Alright, we are on the same page now. Here is a quick rundown on the benefits of doing a pull up or chin up that will make you want to get a bar right now. Doing a Pull Up Works a Lot of Muscle Groups: Pull ups work your back, biceps, shoulders and even some of your core when you are doing the exercise. It’s a great way to hit a lot of muscle groups in one go. Pull Ups Build Muscle Mass: People looking to bulk up in the muscle groups in the arms and back will find out that this exercise helps a lot. Increases Your Gripping Power: The ability to grip the bar and maintain control over your weight while you lift yourself up is easily translated to many other exercises like bench press. Pulls Ups Affect Your Muscle Endurance: The times when you need your power will occur on a field or in the ring, so they won’t take place in a vacuum. Muscular endurance for your back, arms, and shoulders will let you use your power for longer periods of time. As you can see, pull ups provide a lot of benefits and you should definitely consider including them in your training regimen. The first thing that you need to look at with a squat rack with pull up bar is the material. The material is important because you want to make sure that the rack is going to be able to hold weight without flexing or breaking, both of which could be catastrophic for your health. For the most part, you are going to see either 12 or 14 gauge steel in the construction of these racks. Steel is highly durable, strong, and can be powder coated to ensure that it is going to resist damage from rust while also looking good. For commercial gyms, the powder coating is an investment that will make people want to come back compared with old, rusty-looking equipment. You are going to see a fair amount of variance with size and dimensions. You have to take some time to measure out the area where you plan on putting the rack. Also, you have to account for things like the bar and room to walk around the squat rack. You also have to account for height, which often comes out to about seven feet for most racks. While most racks are fairly stable on their own, there are squat racks that have additional pegs that increase stability. That way, the rack doesn’t sway when you put a lot of weight back on it. These are also important for when you are going to be climbing on the pull up bar. The best stability increasing pegs are also made of 12 or 14 gauge steel so that they are strong enough to handle some movement. Another thing that you will want to look at when you are buying a squat rack is any accessories that you can get along with your purchase. These can range from something mundane to important accessories like spotter arms. The spotter arms will help catch the bar in case you are doing a squat and experience failure. It’s a good safety feature that can help you if you’re working out alone. Other accessories include a bench, weights, fastening bolts and more. It’s simple- you get what you pay for. We live by that phrase. There is some fitness equipment that you can get a good deal on that is of moderate quality and that’s fine. Never go for cut-rate stuff that will fall apart or compromise your safety. The best advice is to invest in your squat rack now so that you know that you have a high quality piece that you won’t have to worry about. Right, let's crack on our with list of the best squat racks with a pull up bar. Features plate posts that you can use to store and add weight. The CAP Barbell Deluxe is a great piece of equipment because it is not going empty your wallet to buy, but it will still provide you with a pretty serious value. The first thing that you will want to notice about this model is that it can hold upwards of 600lbs if you had a bar loaded and were doing pull ups. You wouldn’t want to put more than that on there for certain. Next, the construction of the bar is important because it's made out of highly durable 12 and 14-gauge steel. The rack isn’t going to crumble apart after a little bit of use. This goes back to when we were talking about making investments in worthwhile tools. This rack is an investment, but when you buy something that is a solid hunk of steel with powder coating, it’s a good deal. When you’re doing squats, it’s all about safety. This rack will hold a heavy load, but it also comes with some fail safes in the form of safety catches. If you failed at the squat, these protruding arms will catch the bar so it doesn’t take you all the way to the ground with it. Not only could that topple some racks, but it could put you out of commission. With this model, you’re safe even if you’re squatting alone. 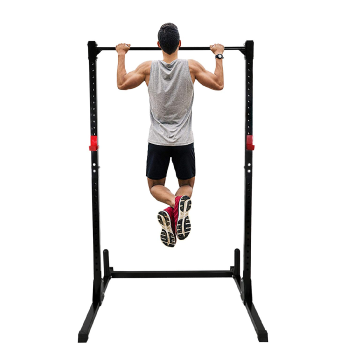 The pull up bar is made from strong tubular steel, so you don’t have to worry about snapping the thing, but it's still rated only for 300 lbs. So if you’re wearing a vest and are coming close to that weight, be smart about it. The height of the bar is 85 inches, so that should be more than enough for most people to do some pull ups and chin ups with unless you are incredibly tall, even then you can still bend your knees so it's all good. The CAP comes with some built-in features that give you a little more value considering the modest price point. The rack has plates to store weights on it as well as six band posts that you can use for various exercises and to increase their intensity. Suddenly, your squat rack is able to help you through a lot more exercises when you take into account all the features. All in all, this is a very good option that provides you with high quality, safety, and a good look that isn’t too flashy. The Titan T-2 Series Squat Rack is a much shorter rack than a lot of them on the market, but that really helps people that are limited in terms of space. Since this thing is only 71.5” tall, it can fit into a lot of basements and garages, making it perfect for a home gym. For people that are trying to get some exercise in their house, this is definitely a good piece of equipment. The Titan T-2 Series is made of 11-gauge steel, which is plenty strong to handle the weight that you are going to be loading it up with. Due to the great construction, you can max this thing out at 700lbs safely. It’s not a good idea to go over that, though. You’ll notice that there are j-hooks and safety catches that come with this rack as well. It’s definitely a must-have if you plan on using this at home if you’re along. While the safety catches might look weak at first glance, they are actually strong, heavy steel that will hold whatever weight you drop onto it. The rack is very easy to take apart and put together and is made of very dense, heavy steel. It’s a very functional piece that includes two weight pegs that you can use to store extra weight when you are not using it. These pegs are on the opposite side of your pull up bar, so it also acts as a counter balance, which is a pretty handy little feature. You can use this versatile piece for a lot of different exercises too. It’s been used for squats, pull ups, deadlifts, benching, curls, and more. If you have the bars and weights, this rack will serve you really well. Overall, you can count on getting a good value on this product, but you are going to pay upfront. This is definitely an investment, but when you see the sheer strength of this model, it will be clear why it belongs on this list amongst the best ones out there. The Fitness Reality 810 XLT is a high quality rack that is most famous for its ability to hook up other Fitness Reality systems, to increase the overall usefulness of the rack. However, we’re here to look at the rack itself, and one of the first things that you’re going to see is the price point. It’s definitely going to be one of the pieces that you invest in so that you have a long-term rack that will work for you. It's frame is fairly big and dense with the steel frame being made of 2” x 2” steel, so it is going to be able to hold a lot of weight. In fact, this model in particular has one of the highest weight limits at 800lbs, so all the heavy lifters out there will be able to max out safely. Since you have the potential to lift such heavy weights, you will be excited to learn about the safety features. You have safety bars on the inside, which are 23” long and coated in chrome. They aren’t the only safety feature that comes with this particular model, though. On the outside of the cage there are safety bars that you can use as well. One feature that people who intent to do a lot of pull ups will like is the fact that the pull up bar is curved like a lat pulldown bar. You can get a lot of different grips that will enable you to work different muscles to a greater degree. The bar itself is solid and the rack weighs enough that you really won’t need to have this thing anchored unless you really want it to be. When you get down to it, this is pretty good at everything it does. You get a strong cage, good safety features, and it will hold a lot of weight for you. 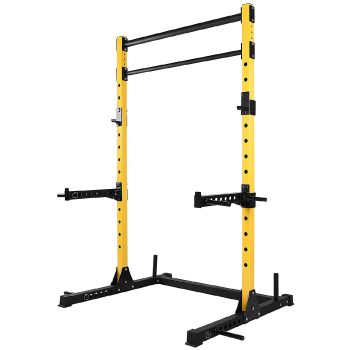 You can also build onto this rack using other attachments that are sold by the company and keep investing until you have a one-stop exercise area in your home or gym. Not all of the options on our list are going to be expensive and fancy - sometimes, going back to basics is best, and that's exactly what we've got here. The Body Champ Power Rack System is a choice that is high on the standards while low on the cost. It’s not as big an investment as some of the other names on this list, but it will still offer you plenty of usability. The squat rack has a frame that features 2” x 1.5” steel, so there is some strength in there, but it is not enough to hold a ton of weight. The listed maximum for this system is 300lbs either on the catches of the bar or on the pull up bar, but that’s a hard max. In other words, don’t go throwing up 320 on this because you are probably putting the frame in danger of failure. That being said, this is a great squat rack for people who are new to it, training lightly, and not looking to increase their squat to crazy heights. There are four potential safety catches that you can change on the outside of the frame, giving you more than enough ways to unload your weight either at the normal height or in the event that you can’t get the bar back up all the way. There are also plate holders on the backside of the bar frame that you can load with weight to keep the entire rack stable while you do pull ups and to store them whilst not in use. The feet are rubberized so they don’t slip as much, but realistically, you should to have some kind of weight on the back or use the built-in anchors to make sure that this doesn’t move while you are using it. The bar that you use for pull ups on this system is high quality. It’s made from steel so you can be sure that it’s going to be able to support your weight. It is a knurled bar so you will get a pretty good grip on this thing while you are using it, too. When you take everything into consideration, it’s clear that the Body Champ squat rack is pretty darn good for the price and on its own merits. 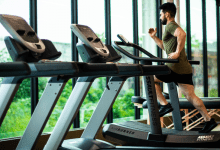 You’ll be able to get a decent workout with this, but its best used in the home rather than at a commercial gym, because it's somewhat limited by the overall weight that you can put on it. Still, if you’re looking for a reliable and inexpensive squat rack, this could be it. 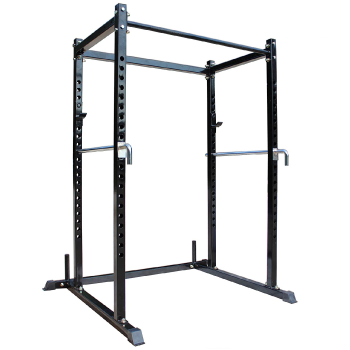 Adjustable height up to 76.4”, total dimensions 44" x 48" x 83"
Anyone that is looking for a good but barebones squat rack and pull up bar will enjoy the F2C Adjustable Height Squat Rack. This fixture is great for people that are looking to add a way to do squats to their home gym but don’t want anything large or very expensive. The frame is made from 2” x 2” steel which is enough to hold 550 pounds at the maximum, but that is definitely as high as you should go. There are bar catches that you can use for the weight to rest upon, but there are no real safety bars. That means you have to be really smart about the amount of weight you’re lifting alone. You can adjust to catches up or down to suit your height and needs. The pull up bar is pretty basic, just a plain bar without any knurling on it so gloves are a good idea to wear for some extra grip. The bar itself can handle up to 300lbs of weight, but you will want to take advantage of the plate holders to get some extra weight on there so you don’t move around. Speaking of moving around, there aren’t anchors on this and the whole thing is not very heavy, so take some time to test out the squat rack before really getting into it. Overall, this is a good beginner’s rack or one that you can keep in the home gym. It’s very inexpensive and will do well for you as long as you manage your expectations. The FUEL Performance Deluxe Power Cage is another very good squat rack and pull up bar combination. There are quite a few notable features that are important with this piece of equipment that stand out. For starters, the entire thing is made of powder coated steel. It’s strong, able to handle quite a bit of weight, and is going to be able to take dings and damage. According to the developers, this can hold up to 500lbs on the rack and 300 on the pull up bar. That’s a really decent amount of weight, but when you get up that high it’s a good idea to anchor it to the floor. Beyond that, the pull up bar isn’t anything to write home about. It will support your weight, but it doesn’t have any grip on it so wear gloves. This one is not really suitable for home unless you put it out in the garage or in a place with high ceilings, because it is every bit of 84 inches tall. You are able to store weight on the pegs at the back of the frame, which helps for stability purposes. As far as safety goes, you can feel content with knowing you have a regular bar rack as well as a safety rack for when you are squatting. All in all, this is a pretty good addition to most gyms because it can handle some tough weight and has good safety features. It’s a middling option in terms of expense, and you can always add more pieces to it if you want a place to do bench work. When it comes time to look at squat racks on the higher end of the quality spectrum, the Hulk Fit model comes to mind. The clue is in the name here - "HULK", as this beast can hold upwards of 800lbs on the rack, so you will be able to push your limits. This model is definitely on the larger side, measuring 81" x 44" x 46", so you have to make sure that you got the room to place it successfully without it scrapping your ceiling. It’s definitely possible to use it in the right place at home, but you are more likely to see this model in a commercial setting. The squat rack comes with many accessories, providing the users a chance to be very safe while working out. To start with, there are two different pull up bars that have different diameters you can use to get the best grip. In addition to the safety catches that you find on this rack, you will also see that you get some j-hooks, dip bars, and weight holders as well. You can feel good using this squat rack alone because of the catch bars being larger than average. Combined with the rubber feet, this should stay pretty still while you’re using it. All in all, this is definitely one of the more expensive models, but it is really beneficial if you’re willing to make the investment. 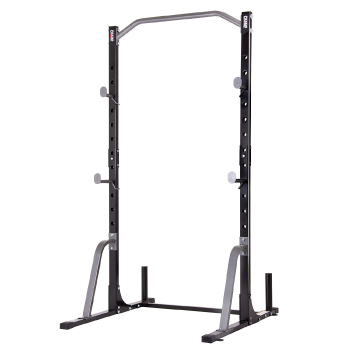 It’s a heavy duty squat rack and pull up bar that offers its users some really great benefits. 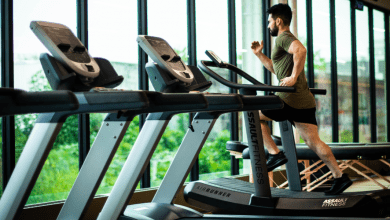 Before we end up this post, lets take a look at home to perform the different exercises you'll be performing with your new piece of equipment. Follow these basic instructions and don’t be afraid to ask for help with form. Stand with your feet just over shoulder width apart so that you involve your muscles in the legs and glutes correctly. Hold the barbell behind your head using a grip that is overhand. You want to rest it across your shoulders and traps and not have it pressing in on your neck. Lift the weight off the bar and step forward so you have clearance. Squat downward with your back straight and your head facing forward while your glutes are pushing outward. Keep lowering yourself until your hips are equal to your knees. Brace your feet, especially heels, and push off with power to lift the weight back up. Continue your set in the same fashion following steps 4-6. As we’ve said, a pull up uses the palms facing away from you on the bar. Here’s the proper form to follow. Place your hands on the bar using an overhand grip while your arms are about shoulder length apart. Hang down off the bar while crossing your legs and pulling them back so that you are no longer standing. Start the pull up by pulling your elbows towards the floor (it sounds ridiculous but it’s not). Keeping going until your chin is passed the bar. You chin should be up and over it. Lower yourself back down and start again. Remember, chin ups use the underhand grip, so we’ll be using that form. Place your hands on the bar in an underhand grip (palms facing you). Grip the bar while maintaining a shoulder-width spacing on the bar. Cross your knees and lift your feet until you are hanging. Pull your elbows to the floor in the same fashion as a pull up until your chin passes the bar. Lower yourself back down again. Right then, which models do we recommend the most? 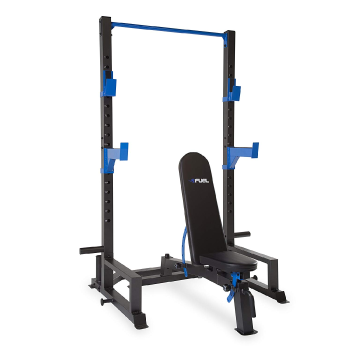 If you are looking to get a squat rack on a budget, then you should check out the F2C Adjustable Height Power Squat Rack. This one is made of quality steel that allows the frame to hold up to 500 lbs. It’s plenty tall enough for all users and it comes with durability increasing powder coating. You can’t do better than this squat rack on a budget. 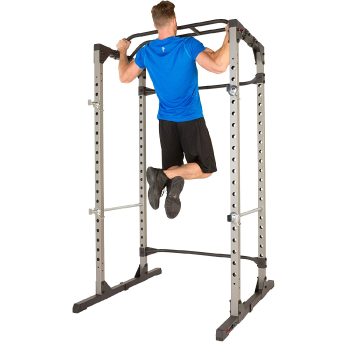 You can still use it for a lot of other exercises due to the open rack design. For all those reasons, this is our top budget choice. The best squat rack with pull up bar that you can get overall is the Cap Barbell Deluxe Power Rack. It’s big, strong, and durable while providing a great value for its cost. It has pegs for resistance bands, can hold 600lbs, has safety racks and regular weight catches, and has a strong pull up bar. This is one of the best racks that you can get your hands on today. It is made of 12 and 14-gauge steel that is powder coated, so it’s going to be able to take a beating and stay supportive for a long time. Overall, this had to be the choice for the best one out there. Picking the right squat rack can take some time. However, when you consider everything in terms of price, accessories, durability, materials and such, the choice becomes clear. As always, thanks for checking out our thoughts and feel free to let us know what you think of the list or just to reach out and ask some questions!